In case you missed it earlier, the Yankees have re-signed RHP David Hale to a new minor league contract. He is stepping right into Triple-A Scranton’s rotation. LHP Daniel Camarena was released to clear a roster spot, the team announced. RHP Erik Swanson will make his next start with Triple-A Scranton, according to Kyle Franko. He’s been great this year. Swanson has a 0.44 ERA (1.61 FIP) with 34.9% strikeouts and 8.1% walks in 40.2 innings with Double-A Trenton. 1B Tyler Austin (foot) faced hitters in live batting practice for the first time today, according to his Twitter feed. He’s been out since fouling a ball off his foot very early in Spring Training. 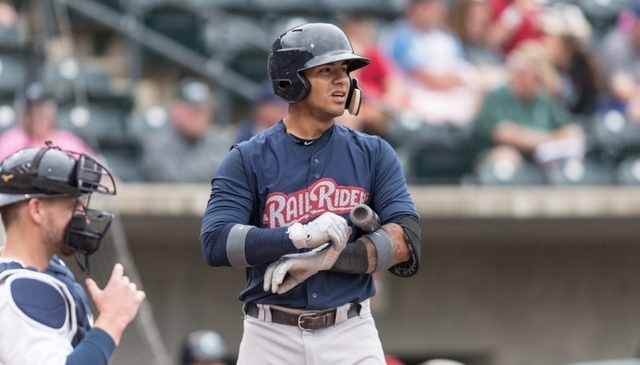 Farm system head Gary Denbo recently said Austin could begin a minor league rehab assignment later this week, as long as things go well the next few days. 1B Ji-Man Choi (hamstring) and LHP Daniel Camarena (shoulder) are likely to miss a few weeks, Triple-A Scranton manager Al Pedrique told Shane Hennigan. With Austin, Choi, and 1B Greg Bird all injured, I wouldn’t expect 1B Chris Carter to be cut loose anytime soon. UTIL Rob Refsnyder was sent back to Triple-A Scranton following last night’s game, the Yankees announced. He was up as the 26th man for the doubleheader. By rule, he had to be sent back down immediately after the game. OF Isiah Gilliam was named the Low-A South Atlantic League Offensive Player of the Week. He went 11-for-23 (.478) with four doubles and two homers last week. C Eddy Rodriguez: 2-5, 1 R, 1 HR, 4 RBI, 3 K — walk-off grand slam! Triple-A Scranton announced several roster moves today. 1B Ji-Man Choi and LHP Daniel Camarena have been placed on the disabled list — I have no idea what’s wrong with either (Camarena missed the entire 2015 season with an elbow injury, it’s worth noting) — and both 1B Mike Ford and RHP Colten Brewer have been bumped up from Double-A Trenton. The Camarena injury and RHP Chad Green call-up solved the whole “seven starters for five spots” problem real quick.